We get asked a lot why London serviced apartments are the best accommodation option in the city. 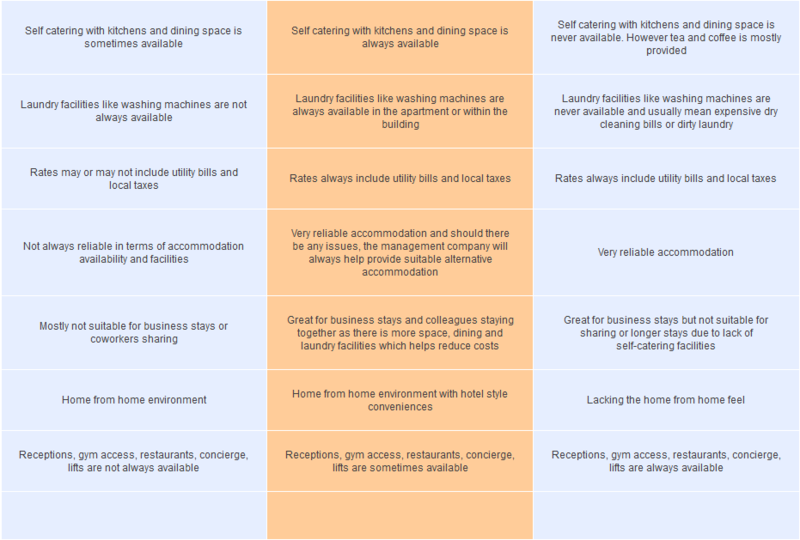 With so many options out there, what sets serviced apartments apart from the rest? Serviced apartments have come a long way in the past few years and now the options and range of facilities are really impressive. From smart aparthotels to traditional townhouses to luxury penthouses, you can find a serviced apartment to suit any type of stay, whatever your reason for visiting London may be. Take a look at the chart below where we detail how serviced apartments can be more reliable and economical than any other option out there on the market. We have compared three options: Serviced apartments versus Private Home Rentals and Hotels and detailed the benefits of same. As you can see from the above table, serviced apartments are a "best of both" solution with greater freedom and space as well as the best rates available. We make sure to get to know what your specific needs are and find you the best London short term accommodation offers available. Yes, hotels are the more well known of the three and often the first option that customers research online but serviced apartments offer more space, self-catering facilities and much more space that standard hotels. Airbnb on the other hand is owner/landlord operated while serviced apartments are professionally managed, which means that they are more consistent with services and facilities and each unit has consistent decor. With landlord-operated apartments, they can vary quite a lot in decor, size and consistency. 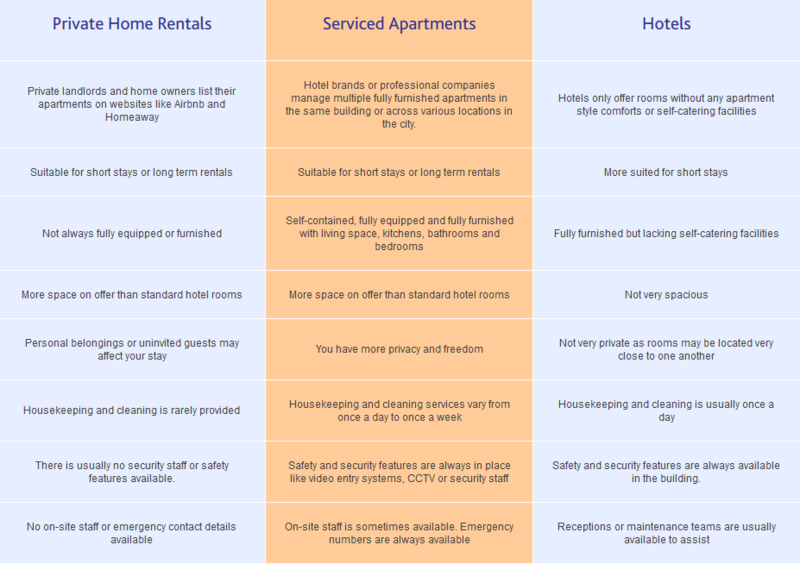 Hotels offer a lot to the visitor in terms of services etc but can be quite basic if you are on a budget with no kitchens/kitchenettes or space to stretch out. Each has their advantages depending on your requirements but serviced apartments appeal across the board offering everything from budget rentals to luxury penthouses and everything in between.